Over a month ago, I gave up my apartment in Delhi, sold most of my belongings, and hit the road (Read: I’m Hitting The Road, Indefinitely). It’s been a roller coaster ride, one that has left me craving a weekend of pampering. The last two days at JW Marriott in Bombay have given me exactly that. A charming bakery with books, teas, home-baked breads, and pastries, the Bombay Baking Company has the perfect recipe for a lazy day of indulgence. Their artisan sandwiches are a must try, and if you believe that it’s never too early for wine, they have an extensive list to choose from. 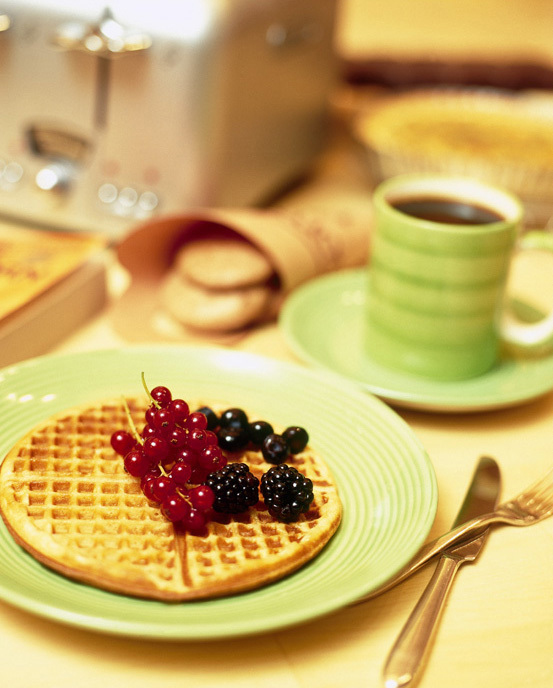 Waffles and tea at BBC. The first thing that struck me about the Royal Lotus Suite was the view from its glass panels, of the swimming pool below and a stretch of Juhu Beach beyond. The living area and the bedroom are spacious yet cosy, with wooden floors, a glass-walled bath tub, a giant rainforest shower, and Bose speakers. You know, the finer luxuries of travelling! 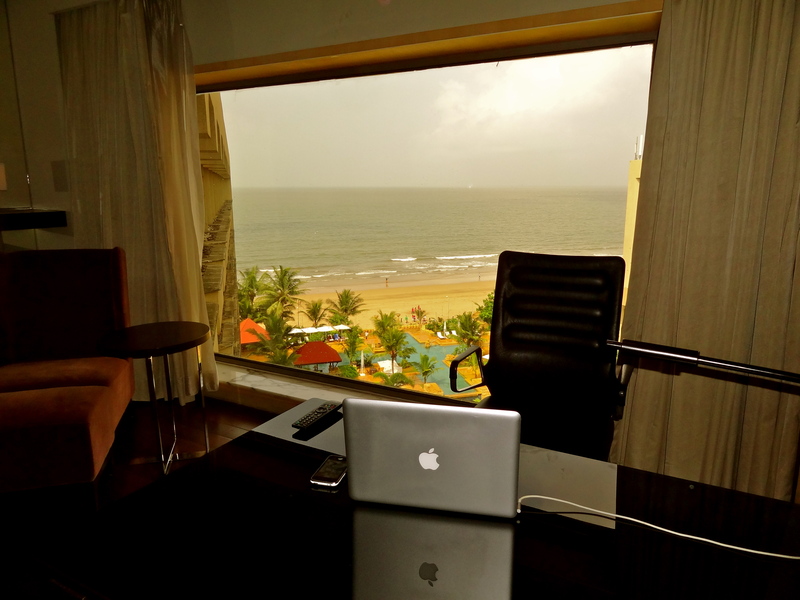 My office for the day, in the Royal Lotus Suite! What’s a Sunday without a lazy brunch? Chef Davide, from the Tuscan region of Italy, personally welcomes his regulars for a taste of Southern Italy right here in Bombay. The pesto gnocchi is my personal favorite, though I recommend you try a little of everything; the breads and cheeses, raviolis, thin crust pizzas, and the wines. You must leave space for the melt-in-the-mouth Tiramisu, a chef specialty. 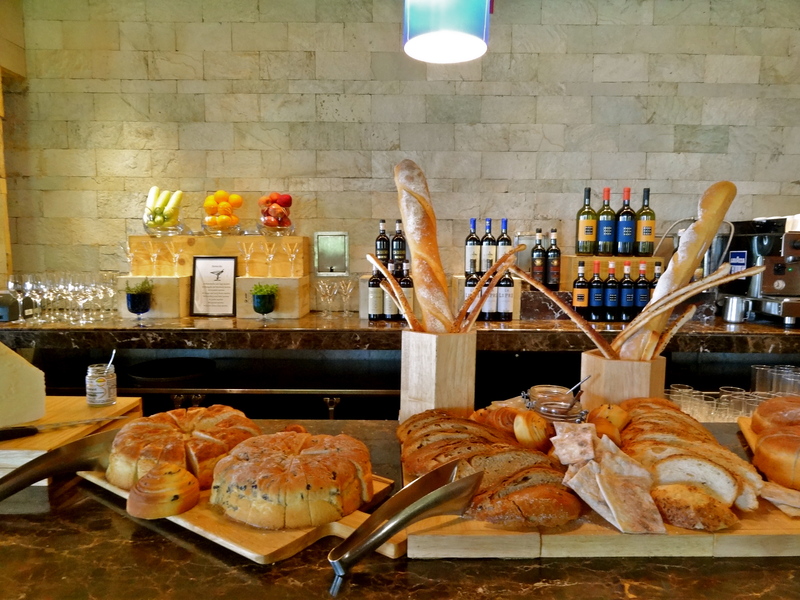 Fine breads, wine and cheeses at Mezzo Mezzo. A really good spa can almost magically rejuvenate a constant traveller like myself, especially if it happens to be Quan’s ultimate spa treatment. Sixty minutes of aromatherapy with stress relieving oils, followed by a Swedish massage, made me feel like a whole new person, ready to embrace bumps on the road again! Photo: Quan Spa at JW Marriott. The last time I was at Juhu beach, many years ago, I reveled in the roadside munchies. The feeling of being close to the sea remains the same, albeit from the comfort of JW Marriott’s Executive Lounge, which only guests from the suites and executive rooms have access to. Indulge in a cup of hot tea with pocket sandwiches, as the sun slowly sinks beneath the horizon. Graduate to a glass of wine as the lights start to flicker in the ensuing darkness. 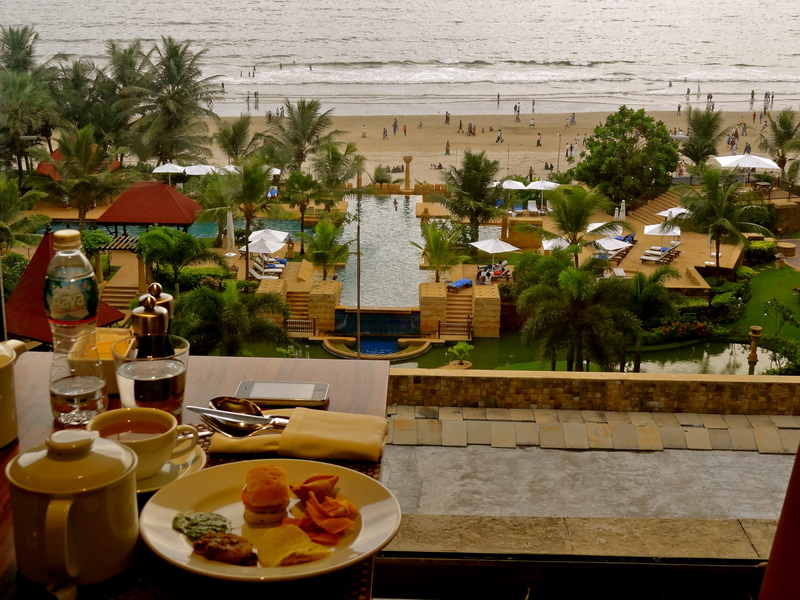 High tea at the Executive Lounge, with a view of Juhu Beach. I’ve heard so much about the nightlife in Bombay, and Arola finally gave me a glimpse. A female DJ spun feet-tapping music as we lounged in the balcony, sampling Arola’s signature gin and tonic cocktail and patata bravas that made me nostalgic about Catalunya. And Chef Manuel, a michelin two star chef, certainly transports you to Spain’s finest tapas bars with his ravishing good looks! Cocktails at Arola. Photo: JW Marriott. 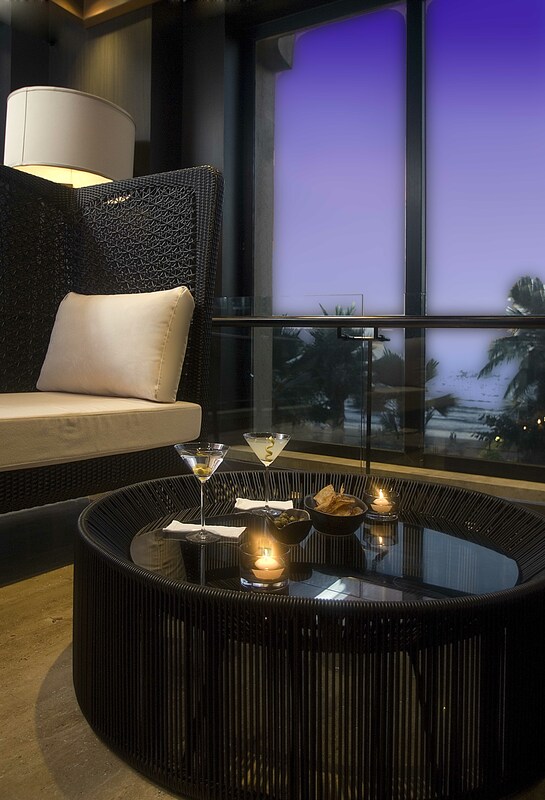 How would you like to pamper yourself at JW Marriott? Note: I was hosted on this trip by JW Marriott. Lucky me! Join The Shooting Star on Facebook, Twitter and Instagram for more travel stories and photos from around India and the world. You should also clearly mention if this was a ‘paid by hotel’ stay (sponsored) or if it was your own expenses. For the sake of transparency. Wow! What should I say! Who wouldn’t want that! But I guess, you have worked hard to get here, so enjoy! Thanks Renuka, hope you get a chance to pamper yourself soon too. And if not staying there, atleast try the bakery / restaurants, they are rather affordable and such great food! Sounds like a brilliant stay! I hope you get one soon, Bharti! And go visit BBC anyway the next time you’re in Bombay; it’s very affordable, and what a lovely place to spend a morning or afternoon. Ooof. I envy you. View of the sea from the suite and high tea watching the sunset…Totally blown out…Over the years i have developed an addiction to the sea…And the click are really awesome Shivya.. I would envy myself in a few days for being here, Sunil 😉 Hope you get to experience some of it when you visit Bombay! It was so relaxing; loved it 🙂 Hope you have yours soon too! Indulgence 🙂 Looks like you had a great time Shivya! Service of JW Marriott is really awesome everywhere. I have used it twice in Pune and once in Agra. I never get the chance yet to be in Mumbai. I hope I will be in Mumbai very soon and again go for Marriott. I just love you informative content and great images. We stayed at the Marriott this past December, and it was absolutely amazing. Great review and pictures. Previous Post7 Authentic Goan Restaurants in North Goa. Next PostIn Photos: Goa in The Monsoons.